TORONTO, ON--(Marketwired - January 23, 2017) - The 2017 ski season is in full swing, and it's already a historic one with ski resorts receiving up to 1318​ cm of snowfall ​so far this year. 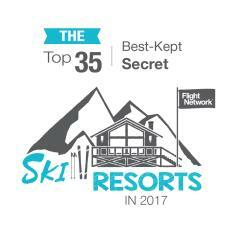 To help winter sports enthusiasts embrace this record-setting season, the travel experts at FlightNetwork.com have created a comprehensive list of North America's top ski resorts, ranking them based on the critical factors of true current snowfall, elevation, kilometres of trails, and price competitiveness. Flight Network's recently released list of the ​Top 35 Best-Kept Secret Ski Resorts for 2017 ​encourages winter sports enthusiasts to visit some of North America's lesser-known, but just as impressive, ski and snowboard areas. "Often, people travel to the most expensive and well-known ski resorts because of their popularity or media coverage," said Neil Bhapkar, Chief Marketing Officer at Flight Network. "But what they usually find is that the first tracks are always taken, the prices are outrageous, and the long lift lines create a less authentic skiing experience." The Flight Network travel experts searched the continent for the top under-the-radar resorts and analyzed resort statistics to find the ones that continuously surpass visitors' expectations in terms of snowfall, elevation, kilometres of trails, and price competitiveness. "Our goal is to introduce Canadian and American winter travelers to the often unknown resorts that offer impressive numbers in terms of snowfall, kilometres of trails, and off-terrain activities for a competitive price and without the overwhelming crowds, " adds Bhapkar. Flight Network ​is one of Canada's largest online travel websites, because it delivers the lowest airfares. Flight Network's customer support is staffed by 150+ travel specialists who help customers find the best travel deals 24/7. Formed in 2005, Flight Network makes travel more convenient, reduces airfares, and saves customers money with its industry-first Price Drop Protection program, which is why millions of flight, hotels, and vacations are booked through the website each year.